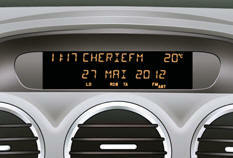 - screen display and vehicle equipment parameter settings menus. With the Peugeot Connect Sound (RD5) switched on, once the "Radio-CD" menu has been selected you can activate or deactivate the functions linked with use of the radio (RDS, REG), or CD (CD introscan, shuffl e, repeat). For more information on the "Radio-CD"
Press the "OK" button to record the change and return to the normal display or press the "ESC" button to cancel.